I honestly don't know what brought me to England. In the cab leaving Heathrow, I was struck with the sensation I sometimes have when I walk into a room and I forget what I had gotten up to get. The feeling had not abated by the time I reached my London pied-à-terre, so I thought to search the previous days' journal entries for clues to the purpose of my visit. Unfortunately, the preceding pages had little to offer in the way of motive. They were just pictures of a horse wearing a hat and a beehive. Those images would be precisely the kind of coded message I would leave myself if I were sent on a secret mission for the government, but they are also the kind of thing I like to draw when otherwise unoccupied. So, I called it a loss, and decided to enjoy my time in England without the burden of a "mission." 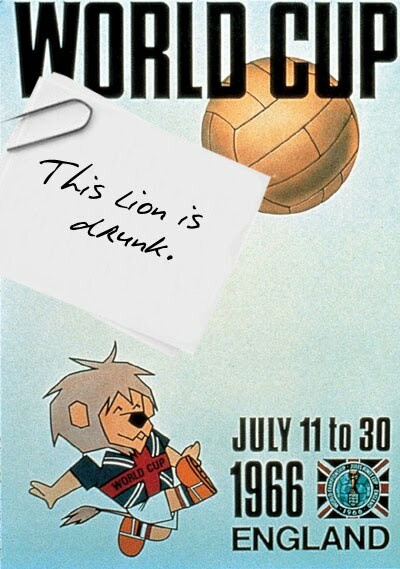 As it turns out, the World Cup is on, so I am enjoying that. Though I never played organized soccer, and have little knowledge of the rules that govern its play, it is a game that I understand and enjoy. The way that the players run around with the ball at their feet reminds me of watching a little dog push a melon that is too big for its mouth (which itself is an esteemed spectator sport in Wales). I also like to imagine that the players have all lost the use of their arms, which makes the games more engaging because I respect their bravery and resilience. Even without my sophisticated appreciation for the sport, I think I would still be glad to take part in the festivities that surround the World Cup. There's something disturbing about seeing each nation's supporters manifesting their country's most grotesque national stereotypes, but in the context of a global celebration, it seems okay. Because the tournament is being hosted by England, her notoriously "enthusiastic" supporters are out in full force. If they are lucky, the nation's alcohol supplies will last until at least the semi-final matches, but I have already seen stores selling cologne as "aperitifs." Should England win the cup, I suspect the country will erupt in jubilation and mayhem. If they lose, however, I think we can expect another one of those world war deals.